A PCL injury occurs when the posterior cruciate ligament of the knee gets overstretched and tears. Diagnosing PCL injuries is difficult and tears are frequently missed. The posterior cruciate ligament is one of the main stabilizing ligaments of the knee. PCL injuries most commonly occurs when there is a sudden force through the top of the shin bone, when the knee hyperextends (bends too far back) or occasionally from a twisting injury. PCL injuries are much less common than ACL injuries. Here, we will look at the role of the posterior cruciate ligament, how it gets damaged and the symptoms, diagnosis and treatment options for a PCL injury. The posterior cruciate ligament is one of a pair of ligaments, along with the anterior cruciate ligament, that sit in the middle of the knee joint. They join the femur to the tibia (thigh bone to shin bone) and control the stability of the knee. The PCL is the stronger of the two ligaments, and as a result is much less commonly damaged than the ACL. The job of the posterior cruciate ligament is to stop the tibia (shin) from moving back too far in relation to the femur (thigh). 2) Swelling: in the knee is usually mild to moderate. It tends to come on rapidly in the first few hours after injury. 4) Difficulty with Activities: most commonly running (especially the initial push-off phase), anything on a bent knee (e.g. stairs), lifting heavy objects and taking off your shoes. Walking may feel "wrong". 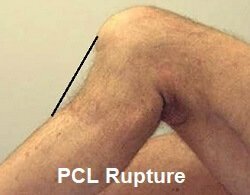 The symptoms of a PCL injury are sometimes quite mild, and as a result it often goes unnoticed. Lingering problems with the knee not feeling quite right are often what leads to a diagnosis. The doctor can usually diagnose a PCL injury from examining your knee to see if the shin bone moves back too far when the knee is bent. An MRI may be done to confirm the diagnosis. With a chronic PCL injury (one that you’ve had for a long time), an MRI may appear normal, despite continuing laxity in the ligament. An x-ray may be done if an avulsion fracture is suspected – where the ligament has torn off bringing a small fragment of bone with it. One simple test you can do is to stand upright and bend your knee to around ninety degrees. If that causes pain, rest your leg down, draw your toes upwards as much as you can (dorsiflexion) and repeat the knee flexion keeping the toes pulled up. If the pain is significantly less, it indicates a PCL injury. With all ligament injuries, there are three different grades of injury. The higher the grade of injury, the longer it will take to recover. 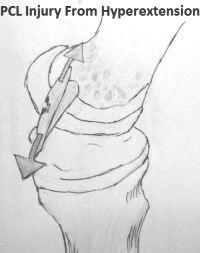 Grade 3: Major injury with the entire ligament being torn, known as a rupture. Sometimes, other structures may be damaged at the same time, such as another knee ligament or a dislocation. So how long does it take to recover from a PCL tear? Most PCL knee injuries are usually grade 1 or 2 and will heal naturally by themselves without the need for surgery within a few weeks. With grade 3 injuries, surgery is often required and it can take months to make a full recovery. People often ask if a completely torn PCL can heal on its own. Unfortunately the answer is no, but it may be possible to build up enough stability that you can live without a functioning posterior cruciate ligament. With more severe injuries, surgery may be required. This is usually advised if there are associated injuries (e.g. damage to other ligaments or patellar dislocation), avulsion injuries (where a piece of bone has broken off) and chronic cases of long-term instability despite adequate rehabilitation. PCL surgery is usually carried out arthroscopically (keyhole surgery) and involves replacing the damaged ligament with a new one, known as a graft, usually fashioned from other tissue such as the patellar or hamstrings tendon. If the tendon is intact but has torn of part of the bone (an avulsion fracture), it will simply be reattached with screws. 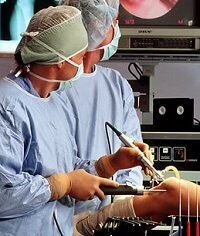 Surgery tends to be more successful when carried out soon after the PCL injury. Following surgery you will work on a rehab programme with a physical therapist and it can take 6-12 months to fully recover. If this is not sounding like your problem and you want help working out what is wrong, visit the knee pain diagnosis section. 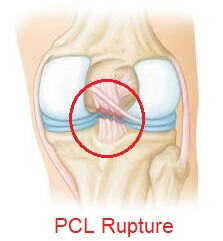 A PCL injury often goes undiagnosed as the symptoms tend to be fairly mild. If you are having ongoing problems with the stability of your knee, or it just doesn’t feel quite right, get it looked at by your doctor.